Amid high political drama in Karnataka, Chief Minister HD Kumaraswamy on Friday presented a 'please all' budget with major focus on agriculture and allied sectors. While substantial allocation has been earmarked towards the farm loan waiver scheme, which the state had announced last July; the budget also provided sound portion of the total allocation towards infrastructure development in the capital city of Bengaluru. With a proposed budget size of Rs 2.34 trillion for fiscal 2019-20, the state has set aside Rs 12,650 crore towards loan waiver scheme which includes crop loans from both commercial and cooperative banks. While the state expects the loan waiver process from cooperatives to conclude by June of this year, for banks, it is likely to completed by end of 2019. The Chief Minister said that his government has released Rs 5,450 crore so far towards farm loan waiver scheme, which had benefitted around 12 lakh farmers. According to the budget estimates, while the revenue receipts are seen at Rs 1.81 trillion and capital receipts are pegged at Rs 48,876 crore. State's borrowing in 2019-20 is estimated to be Rs 48,601 crore. At the same time, revenue expenditure for FY20 is pegged at Rs 1.81 trillion, while capital expenditure proposed is in the tune of Rs 42,584 crore. Despite the higher expenditure, Karnataka eyes to bring down its fiscal deficit to 2.65 per cent in FY20 as against 2.85 per cent recorded in 2018-19 as per revised estimate. In 2019-20, total liabilities of the state is estimated to increase to Rs 3.27 trillion as compared to Rs 2.92 trillion recorded in 2018-19. "State's total liabilities are estimated to be 20.60 per cent of GSDP, which is within the limit of 25 per cent as mandated in Karnataka Fiscal Responsibility Act. Therefore, all these three fiscal parameters are within the mandate of the act, which reflects fiscal prudence of the state," said Kumaraswamy. This year's budget, which is the second one for the JD(S)-Congress party coalition government, provided 19 per cent of the total outlay towards agriculture, irrigation and rural development sectors. With an outlay of Rs 17,212 crore towards irrigation, the state aims to overcome the incidence of droughts that it had faced frequently in the recent years. The state also announced that 'Ayushman Bharat' scheme of the centre would be combined with 'Aroygya Karnataka' programme of the state and would be renamed as 'Ayushman Bharat Karnataka'. "Besides 61.5 lakh existing beneficiaries, it would be extended to another 52 lakh people," the Chief Minister said. While the budget allocated 12 per cent of the total outlay towards social welfare sector, provision towards health sector stood at around four per cent. In the bid to improve the infrastructure of Bengaluru, the state government has proposed to implement 'Nava Bengaluru Kriya Yojane' at an estimated cost of Rs 8,015 crore in the current budget. A provision of Rs 2,300 crore has been done in 2019-20 for implementation of this project. Similarly, Rs 1,000 crore has been earmarked to construct elevated corridors in the city. "It's a challenge to provide infrastructure in Bengaluru. 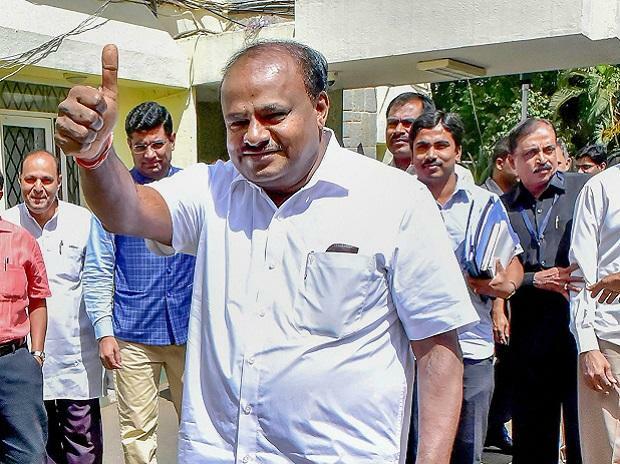 To improve 'Brand Bengaluru', several projects are being taken up that includes peripheral ring road, metro phase-2, suburban rail projects and so on," said Kumaraswamy. The state government also said that it would revise the Information Technology (IT) policy of the state to enable growth of the sector in smaller cities. Despite higher allocation in the budget to various sectors, the state budget only proposed to increase excise duty on alcoholic beverages to mop up revenue. While additional excise duty on beer has been raised by 25 per cent, it was raised by 35 per cent on draught beer. Similarly, beer manufactured in micro-brewery will now see higher excise duty imposition. "I think, this is a 'please all' budget with something for every sector. Higher allocation towards agriculture sector, especially to irrigation, is one of the most striking feature of this budget. However, fiscal deficit target for 2019-20 doesn't seem to be a realistic one," said a top official of an industry body said.